Eat Your City: Eatyourcity.ca in Caribbeans! First stop, St Thomas VI and Barefoot Buddha, paninis, smoothies and a wicked jalapeno cheddar biscuit! Eatyourcity.ca in Caribbeans! First stop, St Thomas VI and Barefoot Buddha, paninis, smoothies and a wicked jalapeno cheddar biscuit! We're off to a Caribbean cruise, and our first stop is the gorgeous small mountainous island of St Thomas, where there's tonnes of great snorkeling spots, beaches, a cool fort you can hike up to, and of course.. all the foodie things we encountered along the way! In the morning, we went straight to the Virgin Islands National Park for some helmet diving - you're wearing a gigantic helmet pumping in O2 with several feet of water over your head. 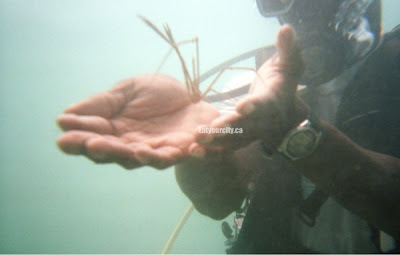 We walked on the ocean floor looking at small schools of fish and even a sea spider! And yes, I did wonder if this little guy would be tasty deep fried to a crispy chip - I know, I'm awful lol! Along the shoreline, there was a little cafe and store, but we opted for the local fruit seller who paddled up to a nearby pier and sold his wares straight off his little boat! Being a hot and humid day, we had a fresh green coconut served up.. it was so full of cool sweet coconut water we got sprayed with it as he pierced the top with his knife! Tangy, sweet and mooshy, make sure you don't eat the seeds or the skin! After we hiked up to the ruins of Fortsberg, a 18th-century citadel fortress and got drenched a few times in pouring rain - well, someone's gotta water all the lush vegetation! But turned out to be a funky coffee - smoothie - organic bakery! Score! And with the added bonus of free wifi for patrons.. woohoos! a wicked jalapeno cheddar biscuit - tender soft and studded generously with pockets of warm melty sharp cheddar, some random pieces of spinach and with just a small hint of hot chilis... Mmmm! We also noshed on yummy grilled albacore tuna melt panini before we did some shopping and headed back to the ship. Can't really go wrong with melty ooey gooey cheese over a lightly seasoned tuna salad -sour cream instead of the usual mayo, fresh crisp young greens, and tomato on a warm lightly toasted bread... well, it could have had more of the ooey gooey cheese... :D Next stop.. Castries, St Lucia!